Critics will say what they will about adverse trends in today’s South Florida real estate market. 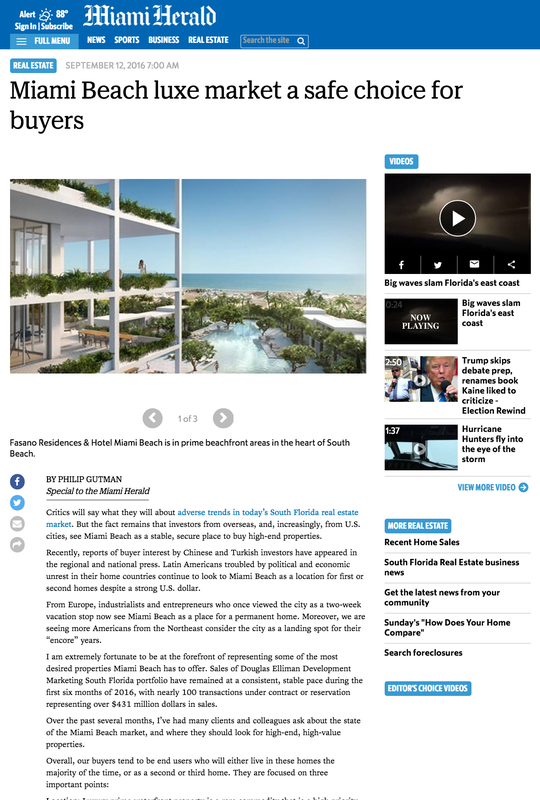 But the fact remains that investors from overseas, and, increasingly, from U.S. cities, see Miami Beach as a stable, secure place to buy high-end properties. Recently, reports of buyer interest by Chinese and Turkish investors have appeared in the regional and national press. Latin Americans troubled by political and economic unrest in their home countries continue to look to Miami Beach as a location for first or second homes despite a strong U.S. dollar. From Europe, industrialists and entrepreneurs who once viewed the city as a two-week vacation stop now see Miami Beach as a place for a permanent home. Moreover, we are seeing more Americans from the Northeast consider the city as a landing spot for their “encore” years. I am extremely fortunate to be at the forefront of representing some of the most desired properties Miami Beach has to offer. Sales of Douglas Elliman Development Marketing South Florida portfolio have remained at a consistent, stable pace during the first six months of 2016, with nearly 100 transactions under contract or reservation representing over $431 million dollars in sales. Over the past several months, I’ve had many clients and colleagues ask about the state of the Miami Beach market, and where they should look for high-end, high-value properties. Location: Luxury prime waterfront property is a rare commodity that is a high priority for our clients. “Location” has always been one of the major rules of real estate and a major component in deciding what projects I present to my client. The Ritz-Carlton Residences, Miami Beach, an expansive seven-acre property located on the private side of Miami Beach within one of the most sought after residential neighborhoods. $2 million and up. Every space throughout The Ritz-Carlton Residences, Miami Beach has been designed to perfection and allows for full access to a distinctive selection of world-class life-enriching amenities and concierge services managed through the Ritz-Carlton. Available to owners includes private boat dockages with a private, on-site captained VanDutch 40 Day Yacht, the world’s first residential art studio, a private cinema-style screening room, indoor-outdoor spa, a state-of-the-art fitness center, a half-acre rooftop pool deck with private cabanas and gourmet restaurant, pet grooming facilities, and meditation garden.